But Kasich has never lost an election in Ohio — and that’s really saying something. The politician launched his career there with a 56% vote win for Senate at the unprecedented age of 26 years old. He served Ohioans in Congress from 1983-2001. Now, at age 63, he remains well-loved in the state, and has served as governor there since 2010. Current Republican front-runner Donald Trump’s most recent behavior indicates he recognizes that, as opposed to his likely usurpation of Marco Rubio’s home state of Florida, John Kasich will be no pushover in Ohio. And Trump now intends to pull out all the stops to vie for the crucial state, which is worth 66 delegates — the second-largest of the “winner takes all” states. According to the latest Quinnipiac poll released yesterday, Kasich is tied with the real estate magnate in Ohio. The two men lead the GOP field there with 38% support each among voters, followed by Ted Cruz at 16%, and Rubio at 3%. Four percent are undecided. 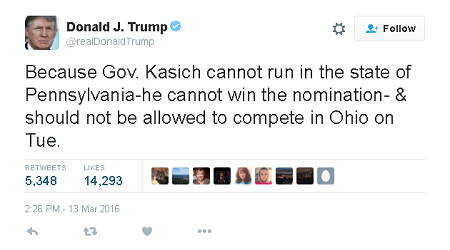 So for the first time in the entire race, Trump has commenced a full-on attack against Kasich. Trump canceled a planned rally in Florida Sunday night to host an impromptu one in Youngstown, Ohio, yesterday evening to bolster numbers. The real estate magnate also made stops in Cincinnati, Cleveland, and Dayton over the weekend, reported Mashable yesterday. "Your governor, when he was a Congressman, voted for NAFTA," Trump said Saturday, according to Mashable Monday morning. 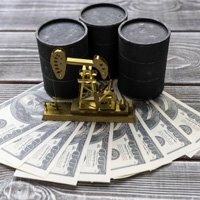 "He was a managing director for Lehman Brothers when it failed." Trump also claimed that Kasich did not succeed in getting onto the Pennsylvania primary ballot because he didn’t file enough signatures. The reality star took to Twitter, posting that Kasich "cannot run in the state of Pennsylvania – he cannot win the nomination – & should not be allowed to compete in Ohio on Tue." The post references a challenge filed against Kasich in Pennsylvania by a supporter of Republican presidential candidate Marco Rubio. Attorneys for both sides have stipulated that the Kasich campaign did not file enough valid petition signatures to meet the state's minimum of 2,000 needed to qualify for the April 26 primary ballot, according to The Pittsburgh Post-Gazette. Kasich's team shot back last night, claiming Trump was responsible for clandestine robocalls to Ohio voters claiming Kasich had missed Pennsylvania’s ballot and should therefore not be permitted on Ohio’s ballot either, stated Mashable. "Trump is lying to Ohioans, and we are consulting with our lawyers on our next steps," Kasich spokesman John Nichols said in a statement yesterday evening. 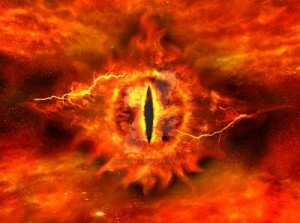 "We are 100% certain that John Kasich will be on the ballot in Pennsylvania,” reported The Morning Call earlier today. 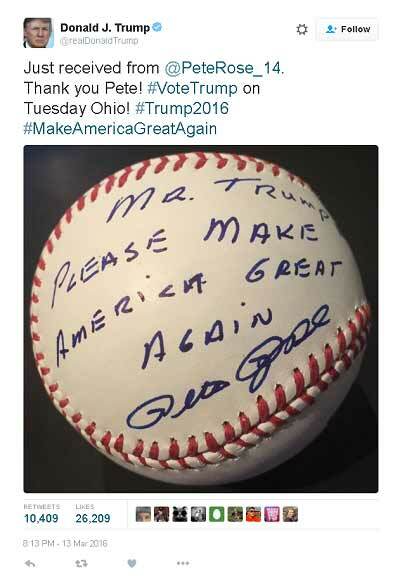 Former Cincinnati Reds baseball hero Pete Rose backed Trump by signing a baseball addressed to the billionaire businessman that said, "Mr. Trump, please make America great again." For more of the latest news regarding Donald Trump's run for presidency, follow us on Twitter @moneymorning, or like us on Facebook.